Across the wider European region, almost 300 million people live in digital exclusion. In today's knowledge based society, digital technologies represent a gateway to economic and social development, and without it their future potential is limited. At Telecentre-Europe, we believe we can help create relevant and scalable approaches towards achieving e-Inclusion for the ones that are left behind. �While before I had to rely on hearing about job vacancies by chance and from neighbors I was amazed to discover a wide range of job-search sites in my own language. I have even signed-up for my first IT course in our local telecentre and I hope to be able to support this great Get Online Day event in the future. It sure opened my eyes!� said Alexandra Tudor, a 44-year old unemployed from Romania. 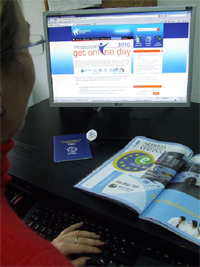 On 4 March 2010 Telecentre-Europe held the first ever European Get Online Day. What a day it turned out to be! More than 50,000 people were reached by the campaign on the day itself, in 42 European countries, and the online counter recorded a total number of 68,253 people during the whole of EC eSkills Week 2010. During the height of the campaign on 4 March, the counter on the Telecentre-Europe site was rising at the rate of about 3,600 an hour ... that's one person every second! The most active Telecentre networks were in Romania, Lithuania and Latvia. In Latvia, over 10,000 people have accessed the online IT barometer to measure their ICT skills, while in Romania over 100 eCentres, libraries, schools and Public Information Access Points (PIAPs) have worked together in a unique way reaching more than 20,000 people. The campaign involved a strong participation of youngsters (60% of total participants) and over 3000 unemployed people got online for the first time ever. Women represented around 60% of participants, while the group of participants aged over 40 reached 20%. Telecentres are community venues where people can go to get help using computers and the internet. Telecentres across Europe held events helping people to learn about the internet, many for the first time. This project across the whole of Europe showed the power of a joined up network! Get Online Day was kindly supported by Microsoft Unlimited Potential. Telecentre-Europe is an inclusive and vibrant network that increases the impact and effectiveness of telecentres throughout Europe by fostering knowledge sharing and learning amongst its members. Telecentres are publicly accessible places where people can get help to access computers, the internet and other digital technologies that enable them to gather information, create, learn, and communicate with others.